Unilever, the Rotterdam-based multi-national consumer goods company, recently fended off a hostile bid from Kraft Heinz. Alarmed, the market wiped 7% off Unilever’s share price, prompting management to start rumbling ominously about the need for “a comprehensive review of options available to accelerate delivery of value for the benefit of our shareholders”. The GMB union not unreasonably decoded this as a signal for drastic cuts coming down the line and wrote to Unilever investors begging them not to go along with the feared retrenchment. The terms in which GMB frames the issue are remarkable. On one side stand the bad capitalists of Kraft Heinz, behind whom lurk the private equity vultures of 3G Capital. On the other side stand the good capitalists of Unilever, with “a proven track record of investment, decent pensions, good working conditions and recognising unions like GMB.” GMB effectively lines up with ‘its own’ capitalist against its rival competitor. Can ‘social partnership’ (class collaboration) get any better than this? Rather than alert its members to the likelihood of storms ahead, rather than explain that even the (supposedly) most paternalistic employer will be driven to act as the market dictates as soon as maximum profits are at stake, rather than mobilise workers for the coming struggle, the GMB concentrates its members’ minds on the virtues of ‘sustainable capitalism,’ appealing to Unilever’s better nature! 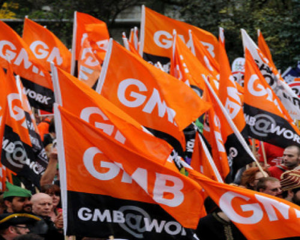 It is abundantly clear now why Unilever is so happy to recognise “unions like GMB”. After all, why keep a dog and bark yourself? (‘Unilever’s £34 billion Brand Value Proves Sustainable Capitalism Works,’ GMB website, 22 March 2017).